We’d love your help. Let us know what’s wrong with this preview of Because Self-Publishing Works by V.V. Cam. Make your self-publishing business more successful. Stop doing random acts of marketing and start following a solid plan to grow your business. For many authors, marketing a book takes a lot of time and yields little or no improvement in sales. Getting your book noticed can feel like an impossible task. Sales surges can disappear as quickly as they arrive. But the result of Make your self-publishing business more successful. Stop doing random acts of marketing and start following a solid plan to grow your business. For many authors, marketing a book takes a lot of time and yields little or no improvement in sales. Getting your book noticed can feel like an impossible task. Sales surges can disappear as quickly as they arrive. But the result of doing nothing is even more disappointing. Caught in this cycle, most authors end up chasing after reviews, doing a few author interviews or throwing money at sporadic promotions in hopes of selling a few more books. In this book, I take fundamental marketing principles and apply them to marketing self-published books. I will walk you through building a marketing plan that maps out your own complete and actionable steps to get substantial and sustainable results for your self-publishing business. Whether you’re just starting out or are an experienced author, this book is the easiest and fastest way to create a marketing plan that will boost your business growth. To ask other readers questions about Because Self-Publishing Works, please sign up. This is a work that I would recommend to all the budding authors. In the second part of the "because" series, the author explains her experience in marketing while helping her husband self publishing his book 'because'. Writing a book has become common these days but getting it published and then marketing it to the public is a story in itself. V. V. Cam is a true entrepreneur and it is axiomatic through her writing and commitment towards her work. She doesn't wander away from her focus. Her writ This is a work that I would recommend to all the budding authors. She doesn't wander away from her focus. Her writing is not only motivating for the upcoming authors but it also speaks volumes about the knowledge she has gained. For any self-publish author, this book would prove to be a gem. Straightforward writing and innovative advice. I have come across a number of authors whose books can be categorized as gems and need to be read by everyone. Yet, their books will not reach to their relevant audience. The books die a silent death and that hurts. and write Chinese. A year later, a church sponsored her family to start their new life in a small town in Ontario, Canada. She put her language learning skills to use again, this time mastering English. She soon became one of the top students at her school and helped the office staff with her typing and office skills. Along with her industrious family, she learned to sew and made money sewing for local shops and for friends. Her resume soon included an impressive list of accomplishments: She worked her way from seamstress, waitress, bartender, and receptionist to IT support specialist and trainer, to real estate agent and broker. She has worked in executive positions with large organizations managing finances, human resources, and relationships and has built a couple of small businesses. In her spare time, she created two high-traffic and successful websites that offer teaching tools and support to the Vietnamese communities. She’s also founded a philanthropic organization that provides micro loans for poor people in Vietnam. From that inviting opening VV shares the steps in the important marketing aspect of self-publishing in a manner that is accessible and easy to follow. She takes us through the steps – Marketing Strategy, Marketing Plan (Connect, Convince, Care phases), Marketing Tactics (product design, discoverability, advertising), Promotion, Publicity, Public Relations, Customer Retention, a Marketing checklist (very valuable), a Marketing Toolkit, Marketing costs and much more. I’m a self-published author of fourteen books, but my sales are lacklustre, to say the least. To quote V.V Cam “I’ve used sporadic marketing tactics: chasing after reviews, doing a few author interviews and throwing money at promotions with the hope of selling a few more books.” Like 95% of all self-published authors, I lack well-honed, professional marketing skills and knowledge. For any new, or recent writer whose sales are in the doldrums, this book is for you. If you’ve Googled searched, you’ I’m a self-published author of fourteen books, but my sales are lacklustre, to say the least. To quote V.V Cam “I’ve used sporadic marketing tactics: chasing after reviews, doing a few author interviews and throwing money at promotions with the hope of selling a few more books.” Like 95% of all self-published authors, I lack well-honed, professional marketing skills and knowledge. For any new, or recent writer whose sales are in the doldrums, this book is for you. If you’ve Googled searched, you’ll know there are tonnes of marketing information on the Internet, but what is lacking is a decent structure to build a marketing strategy and plan. This is where ‘Everything I Learned About How To Market a Book’ scores highly. 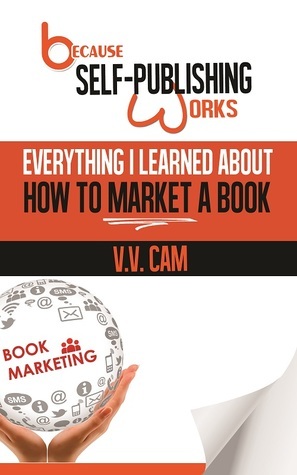 V.V Cam has a professional marketing background, and she has put her hard-won knowledge and experience to good use to drive the sales of her husband’s book ‘Because’ by Jack A Langedijk, to a respectable level for both paperback and Kindle editions. Now she is sharing all she knows in this very complete ‘how to…’ book. You only have to look at the Table of Contents to see how complete she is. Note; this book is not for wimps. I love ‘How to…’ books, but it’s one thing to buy the book, another to read it, but it’s a totally different matter putting into practice all the ideas and suggestions. It’s at this stage many authors give up – tenacity, dedication, commitment and a realistic budget are paramount. As V.V Cam points out, there is no marketing silver bullet. However, V.V Cam has come to your aid with predesigned, downloadable templates, self-analysis questions, a plethora of web links to useful resources, and a copious amount of hints and tips. I have no hesitation in recommending this book to any serious self-published writer. And if you are a first timer contemplating writing the next best-seller, I suggest you read this book to understand the world you are entering into. You’ll realise writing a book is relatively easy! With Amazon, Kobo, Smashwords, Draft2Digital, etc. listing over nine million books for sale, you soon appreciate it’s a formidable challenge to break into the top 20% where you need to be if you are looking to earn a living from writing. The only real chance you have of doing this is to adopt the strategy so comprehensively laid out in this book. And finally, does the strategy work? Only time will tell. I’m fully on board and will let you know in 12 months. I could browse all the options introduced and pick some of them that really fit for my circumstances! Chapter 2 Marketing 101 alone made me forget about all other self-published book marketing instructions I've read in last two years. The author doesn’t give the readers sugar-coated advices about I could browse all the options introduced and pick some of them that really fit for my circumstances! Personally I believe there’s no point reading a book if we never learn anything; we have to think to understand some new, unfamiliar discoveries that are to confuse the readers. If we just wanna enjoy the emotional satisfaction without any confusion in thought, why bother reading a book in the first place, watching soap-operas is more convenient for that purpose, isn’t that? Just for more popularity to sell more copies for more profit…I don’t like it, yet this book is about marketing, so yes, it’s a right advice within the book’s purpose. It only scares me because it’s so true and honest about the reality. Just like the previous one, this volume with marketing tips is the most realistic and practical advices with a lot of actual writing community for reviews and marketing web site addresses introduced throughout the pages. As a June 2017 follow-up to Everything I Learned About How to Publish a Book, the Because series by author Virginia Cam features Everything I Learned About How to Market a Book. Successfully marketing your book takes a lot of time and perseverance. Tips and tools to help you spend your energy as efficient as possible are welcome. There are seven important aspects that demand your marketing efforts: product design, discoverability, advertising, promotion, publicity, public relations, and customer As a June 2017 follow-up to Everything I Learned About How to Publish a Book, the Because series by author Virginia Cam features Everything I Learned About How to Market a Book. Successfully marketing your book takes a lot of time and perseverance. Tips and tools to help you spend your energy as efficient as possible are welcome. There are seven important aspects that demand your marketing efforts: product design, discoverability, advertising, promotion, publicity, public relations, and customer retention, a somewhat tweaked version of the classic 4 P's in Marketing (price, product, place, promotion). Cam provides a wealth of information to draft your marketing plan, and execute it. Good practices on approaching libraries, book reviewers, involvement in social media, getting your book categorized properly in Amazon to online link analyzers, and pricing. Disclaimer: I received a digital copy of this book from the author in exchange for an honest review. This book contains a lot of information on marketing your book if you do publishing an indie way (perhaps following Because Self-Publishing Works: Everything I Learned About How to Publish a Book). And this information is useful. I am an aspiring indie writer too, however, in the non-fiction, tech industry. I never invested in marketing strategy because a) I'm lazy and b) didn't reserve the time to Disclaimer: I received a digital copy of this book from the author in exchange for an honest review. I am an aspiring indie writer too, however, in the non-fiction, tech industry. I never invested in marketing strategy because a) I'm lazy and b) didn't reserve the time to do my marketing. And this represents in my sales. Fortunately, I don't write for a living, but with this guide in my pocket, I have the inspiration to create my marketing strategy and try out what I've learned in 2018. Every topic has a list of online resources, if applicable: websites which can host your author homepage, host giveaways, have a lot of reviewers and so on. I learned a lot of new websites which I can visit to be a reviewer or use for marketing my books in the future. V.V. Cam's philosophy of life exemplifies the saying “Give a man a fish, and you feed him for a day. Teach a man to fish, and you feed him for a lifetime.” When it comes to exploring the ever-changing world of self-publishing, V.V. has proven she is no stranger to embracing new worlds and ideas. She has not only learned how to fish, but also has spent her life teaching hundreds of others to become V.V. Cam's philosophy of life exemplifies the saying “Give a man a fish, and you feed him for a day. Teach a man to fish, and you feed him for a lifetime.” When it comes to exploring the ever-changing world of self-publishing, V.V. has proven she is no stranger to embracing new worlds and ideas. She has not only learned how to fish, but also has spent her life teaching hundreds of others to become self-reliant. The two books in the Because Self-Publishing Works series share the knowledge she learned while helping her husband publish and market his book. In Because Money Matters, she shares the lessons and wisdom she learned from her mother in managing personal finance.